This article is about Earth as a planet. For the Earth's geography, see World. For other uses, see Earth (disambiguation). 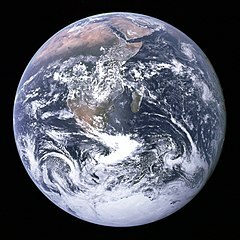 Famous "Blue Marble" photograph of Earth, taken from Apollo 17. 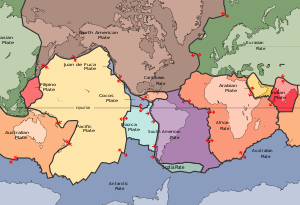 A map illustrating the Earth's major plates. Present day Earth altimetry and bathymetry. Data from the National Geophysical Data Center's TerrainBase Digital Terrain Model. Elevation histogram of the surface of the Earth — approximately 71% of the Earth's surface is covered with water. Source regions of global air masses. This view from orbit shows the full Moon partially obscured by the Earth's atmosphere. NASA image. The Earth's magnetic field, which approximates a dipole. An animation showing the rotation of the Earth. Earth seen as a tiny dot by the Voyager 1 spacecraft, more than 6 billion kilometers (4 billion miles) from Earth. Earth and Moon from Mars, imaged by Mars Global Surveyor. Viewed from Earth, the Moon is just far enough away to have very nearly the same apparent-sized disk as the Sun. The angular size (or solid angle) of these two bodies match because, although the Sun's diameter is about 400 times as large as the Moon's, it is also 400 times more distant. This allows total and annular eclipses to occur on Earth. A scale representation of the relative sizes of, and distance between, Earth and Moon. The estimated amount of irrigated land in 1993 was 2,481,250 km². The Earth at night, a composite of DMSP/OLS ground illumination data on a simulated night-time image of the world. This image is not photographic and many features are brighter than they would appear to a direct observer. In total, about 400 people have been outside the Earth's atmosphere as of 2004, and, of these, twelve have walked on the Moon. Normally the only humans in space are those on the International Space Station. The station's crew of three people is usually replaced every six months. The first photograph ever taken of an "Earthrise," on Apollo 8. Artist's conception of the remains of artificial structures on the Earth after the Sun enters its red giant phase and swells to roughly 100 times its current size. The Sun, as part of its solar lifespan, will expand to a red giant in 5.5 Gyr. Models predict that the Sun will expand out to about 99% of the distance to the Earth's present orbit (1 astronomical unit, or AU). However, by that time, the orbit of the Earth may have expanded to about 1.7 AUs because of the diminished mass of the Sun. The planet might thus escape envelopment by the expanded Sun's sparse outer atmosphere, though most (if not all) existing life will have been destroyed by the Sun's proximity to the Earth. ^ a b c The WGS 84 reference ellipsoid. ^ This is the radius that gives a sphere with the same volume as the WGS 84 reference ellipsoid. ^ a b Yoder, C. F. (1995) p. 12. Blue, Jennifer (July 5, 2007). Descriptor Terms (Feature Types). Gazetteer of Planetary Nomenclature. USGS. Retrieved on 2007-07-05. ^ May, Robert M. (1999). "How many species are there on earth?". Science 241 (4872): 1441-1449. Retrieved on 2007-08-14. ^ a b Dalrymple, G.B. (1991). The Age of the Earth. California: Stanford University Press. ISBN 0-8047-1569-6. ^ Newman, William L. (July 9, 2007). Age of the Earth. Publications Services, USGS. Retrieved on 2007-09-20. ^ Dalrymple, G. Brent (2001). "The age of the Earth in the twentieth century: a problem (mostly) solved". Geological Society, London, Special Publications 190: 205-221. Retrieved on 2007-09-20. ^ Stassen, Chris (September 10, 2005). The Age of the Earth. The TalkOrigins Archive. Retrieved on 2007-09-20. ^ Other planets in the solar system are either too hot or too cold to support liquid water. However, it is confirmed to have existed on the surface of Mars in the past, and may still appear today. See: Msnbc. "Rover reveals Mars was once wet enough for life", NASA, Marchr 02, 2007. Retrieved on 2007-08-28. Staff. "Simulations Show Liquid Water Could Exist on Mars", University of Arkansas, November 7, 2005. Retrieved on 2007-08-08. ^ As of 2007, water vapor has been detected in the atmosphere of only one extrasolar planet, and it is a gas giant. See: G. Tinetti et al. (July, 2007). "Water vapour in the atmosphere of a transiting extrasolar planet". Nature 448: 169-171. ^ The number of solar days is one less than the number of sidereal days because the orbital motion of the Earth about the Sun results in one additional revolution of the planet about its axis. ^ Ahrens, Global Earth Physics: A Handbook of Physical Constants, p. 8. ^ a b Morbidelli, A.; Chambers, J.; Lunine, J. I.; Petit, J. M.; Robert, F.; Valsecchi, G. B.; Cyr, K. E. (2000). "Source regions and time scales for the delivery of water to Earth". Meteoritics & Planetary Science 35 (6): 1309–1320. Retrieved on 2007-03-06. ^ Canup, R. M.; Asphaug, E. (Fall Meeting 2001). "An impact origin of the Earth-Moon system". Abstract #U51A-02, American Geophysical Union. Retrieved on 2007-03-10. ^ R. Canup and E. Asphaug (2001). "Origin of the Moon in a giant impact near the end of the Earth's formation". Nature 412: 708–712. ^ Doolittle, W. Ford (February, 2000). "Uprooting the tree of life". Scientific American 282 (6): 90–95. ^ Berkner, L. V.; Marshall, L. C. (1965). "On the Origin and Rise of Oxygen Concentration in the Earth's Atmosphere". Journal of Atmospheric Sciences 22 (3): 225–261. Retrieved on 2007-03-05. ^ Burton, Kathleen (November 29, 2000). Astrobiologists Find Evidence of Early Life on Land. NASA. Retrieved on 2007-03-05. ^ Murphy, J. B.; Nance, R. D. (1965). "How do supercontinents assemble?". American Scientist 92: 324–33. Retrieved on 2007-03-05. ^ Kirschvink, J. L. (1992). The Proterozoic Biosphere: A Multidisciplinary Study. Cambridge University Press, 51–52. ISBN 0521366151. ^ Raup, D. M.; Sepkoski, J. J. (1982). "Mass Extinctions in the Marine Fossil Record". Science 215 (4539): 1501–1503. Retrieved on 2007-03-05. ^ Gould, Stephan J. (October , 1994). "The Evolution of Life on Earth". Scientific American. Retrieved on 2007-03-05. ^ Wilkinson, B. H.; McElroy, B. J. (2007). "The impact of humans on continental erosion and sedimentation". Bulletin of the Geological Society of America 119 (1–2): 140–156. Retrieved on 2007-04-22. ^ Staff. Paleoclimatology - The Study of Ancient Climates. Page Paleontology Science Center. Retrieved on 2007-03-02. ^ Stern, David P. (November 25, 2001). Planetary Magnetism. NASA. Retrieved on 2007-04-01. ^ Milbert, D. G.; Smith, D. A.. Converting GPS Height into NAVD88 Elevation with the GEOID96 Geoid Height Model. National Geodetic Survey, NOAA. Retrieved on 2007-03-07. ^ Mohr, P.J. ; Taylor, B.N. (October, 2000). Unit of length (meter). NIST Reference on Constants, Units, and Uncertainty. NIST Physics Laboratory. Retrieved on 2007-04-23. ^ a b Sandwell, D. T.; Smith, W. H. F. (Jul7 26, 2006). Exploring the Ocean Basins with Satellite Altimeter Data. NOAA/NGDC. Retrieved on 2007-04-21. ^ Staff (November, 2001). WPA Tournament Table & Equipment Specifications. World Pool-Billiards Association. Retrieved on 2007-03-10. ^ Senne, Joseph H. (2000). "Did Edmund Hillary Climb the Wrong Mountain". Professional Surveyor 20 (5). Retrieved on 2007-02-04. ^ Morgan, J. W.; Anders, E. (1980). "Chemical composition of Earth, Venus, and Mercury". Proceedings of the National Academy of Science 71 (12): 6973–6977. Retrieved on 2007-02-04. ^ This article incorporates text from the Encyclopædia Britannica Eleventh Edition article "Petrology", a publication now in the public domain. ^ Tanimoto, Toshiro (1995). in Thomas J. Ahrens: Crustal Structure of the Earth (PDF), Washington, DC: American Geophysical Union. ISBN 0-87590-851-9. Retrieved on 2007-02-03. ^ Jordan, T. H. (1979). "Structural Geology of the Earth's Interior". Proceedings National Academy of Science 76 (9): 4192–4200. Retrieved on 2007-03-24. ^ Robertson, Eugene C. (July 26, 2001). The Interior of the Earth. USGS. Retrieved on 2007-03-24. ^ Sanders, Robert. "Radioactive potassium may be major heat source in Earth's core", UC Berkeley News, December 10, 2003. Retrieved on 2007-02-28. ^ Alfè, D.; Gillan, M. J.; Vocadlo, L.; Brodholt, J; Price, G. D. (2002). "The ab initio simulation of the Earth's core" (PDF). Philosophical Transaction of the Royal Society of London 360 (1795): 1227–1244. Retrieved on 2007-02-28. ^ Richards, M. A.; Duncan, R. A.; Courtillot, V. E. (1989). "Flood Basalts and Hot-Spot Tracks: Plume Heads and Tails". Science 246 (4926): 103–107. Retrieved on 2007-04-21. ^ Staff (February 27, 2004). Crust and Lithosphere. Plate Tectonics & Structural Geology. The Geological Survey. Retrieved on 2007-03-11. ^ Kious, W. J.; Tilling, R. I. (May 5, 1999). Understanding plate motions. USGS. Retrieved on 2007-03-02. ^ Brown, W. K.; Wohletz, K. H. (2005). SFT and the Earth's Tectonic Plates. Los Alamos National Laboratory. Retrieved on 2007-03-02. ^ Meschede, M.; Udo Barckhausen, U. (November 20, 2000). Plate Tectonic Evolution of the Cocos-Nazca Spreading Center. Proceedings of the Ocean Drilling Program. Texas A&M University. Retrieved on 2007-04-02. ^ Staff. GPS Time Series. NASA JPL. Retrieved on 2007-04-02. ^ a b Pidwirny, Michael (2006). Fundamentals of Physical Geography. PhysicalGeography.net. Retrieved on 2007-03-19. ^ Kring, David A.. Terrestrial Impact Cratering and Its Environmental Effects. Lunar and Planetary Laboratory. Retrieved on 2007-03-22. ^ Duennebier, Fred (August 12, 1999). Pacific Plate Motion. University of Hawaii. Retrieved on 2007-03-14. ^ Mueller, R.D. ; Roest, W.R.; Royer, J.-Y. ; Gahagan, L.M. ; Sclater, J.G. (March 7, 2007). Age of the Ocean Floor Poster. NOAA. Retrieved on 2007-03-14. ^ Staff. Layers of the Earth. Volcano World. Retrieved on 2007-03-11. ^ Jessey, David. Weathering and Sedimentary Rocks. Cal Poly Pomona. Retrieved on 2007-03-20. ^ Staff. Minerals. Museum of Natural History, Oregon. Retrieved on 2007-03-20. ^ Cox, Ronadh (2003). Carbonate sediments. Williams College. Retrieved on 2007-04-21. ^ a b c d Staff (February 8, 2007). The World Factbook. U.S. C.I.A.. Retrieved on 2007-02-25. ^ FAO Staff (1995). FAO Production Yearbook 1994, Volume 48, Rome, Italy: Food and Agriculture Organization of the United Nations. ISBN 9250038445. ^ a b Mill, Hugh Robert (1893). "The Permanence of Ocean Basins". The Geographical Journal 1 (3): 230–234. Retrieved on 2007-02-25. ^ Staff. "Deep Ocean Studies". Ocean Studies. RAIN National Public Internet and Community Technology Center. Retrieved on 2006-04-02. ^ Takuyo measurement; see Mariana Trench for details. ^ The total volume of the Earth's oceans is: 1.4×109 km³. The total surface area of the Earth is 5.1×108 km². So, to first approximation, the average depth would be the ratio of the two, or 2.7 km. ^ Igor A. Shiklomanov et al (1999). World Water Resources and their use Beginning of the 21st century" Prepared in the Framework of IHP UNESCO. State Hydrological Institute, St. Petersburg. Retrieved on 2006-08-10. ^ Mullen, Leslie (June 11, 2002). Salt of the Early Earth. NASA Astrobiology Magazine. Retrieved on 2007-03-14. ^ Morris, Ron M.. Oceanic Processes. NASA Astrobiology Magazine. Retrieved on 2007-03-14. ^ Scott, Michon (April 24, 2006). Earth's Big heat Bucket. NASA Earth Observatory. Retrieved on 2007-03-14. ^ Sample, Sharron (June 21, 2005). Sea Surface Temperature. NASA. Retrieved on 2007-04-21. ^ a b c Williams, David R. (September 1, 2004). Earth Fact Sheet. NASA. Retrieved on 2007-03-17. ^ a b Staff (October 8, 2003). Earth's Atmosphere. NASA. Retrieved on 2007-03-21. ^ a b Moran, Joseph M. (2005). Weather. World Book Online Reference Center. NASA/World Book, Inc.. Retrieved on 2007-03-17. ^ a b Berger, Wolfgang H. (2002). The Earth's Climate System. University of California, San Diego. Retrieved on 2007-03-24. ^ Rahmstorf, Stefan (2003). The Thermohaline Ocean Circulation. Potsdam Institute for Climate Impact Research. Retrieved on 2007-04-21. ^ Various (July 21, 1997). The Hydrologic Cycle. University of Illinois. Retrieved on 2007-03-24. ^ Staff. Climate Zones. UK Department for Environment, Food and Rural Affairs. Retrieved on 2007-03-24. ^ Staff (2004). Stratosphere and Weather; Discovery of the Stratosphere. Science Week. Retrieved on 2007-03-14. ^ de Córdoba, S. Sanz Fernández (June 21, 2004). 100 km. Altitude Boundary for Astronautics. Fédération Aéronautique Internationale. Retrieved on 2007-04-21. ^ Liu, S. C.; Donahue, T. M. (1974). "The Aeronomy of Hydrogen in the Atmosphere of the Earth". Journal of Atmospheric Sciences 31 (4): 1118–1136. Retrieved on 2007-03-02. ^ Abedon, Stephen T. (March 31, 1997). History of Earth. Ohio State University. Retrieved on 2007-03-19. ^ Fitzpatrick, Richard (February 16, 2006). MHD dynamo theory. NASA WMAP. Retrieved on 2007-02-27. ^ Campbell, Wallace Hall (2003). Introduction to Geomagnetic Fields. New York: Cambridge University Press, p57. ISBN 0521822068. ^ Stern, David P. (July 8, 2005). Exploration of the Earth's Magnetosphere. NASA. Retrieved on 2007-03-21. ^ Fisher, Rick (January, 30, 1996). Astronomical Times. National Radio Astronomy Observatory. Retrieved on 2007-03-21. ^ Williams, David R. (September 1, 2004). Moon Fact Sheet. NASA. Retrieved on 2007-03-21. ^ Fisher, Rick (February 5, 1996). Earth Rotation and Equatorial Coordinates. National Radio Astronomy Observatory. Retrieved on 2007-03-21. ^ Aphelion is 103.4% of the distance to perihelion. Due to the inverse square law, the radiation at perihelion is about 106.9% the energy at aphelion. ^ Williams, Jack (December 20, 2005). Earth's tilt creates seasons. USAToday. Retrieved on 2007-03-17. ^ Vázquez, M.; Montañés Rodríguez, P.; Palle, E. (2006). The Earth as an Object of Astrophysical Interest in the Search for Extrasolar Planets. Instituto de Astrofísica de Canarias. Retrieved on 2007-03-21.
where m is the mass of the Earth, a is an Astronomical Unit, and M is the mass of the Sun. So the radius in A.U. is about: . ^ Staff (October, 1998). Explorers: Searching the Universe Forty Years Later (PDF). NASA/Goddard. Retrieved on 2007-03-05. ^ Espenak, F.; Meeus, J. (February 7, 2007). Secular acceleration of the Moon. NASA. Retrieved on 2007-04-20. ^ Poropudas, Hannu K. J. (December 16, 1991). Using Coral as a Clock. Skeptic Tank. Retrieved on 2007-04-20. ^ Laskar, J.; Robutel, P.; Joutel, F.; Gastineau, M.; Correia, A.C.M. ; Levrard, B. (2004). "A long-term numerical solution for the insolation quantities of the Earth". Astronomy and Astrophysics 428: 261–285. Retrieved on 2007-03-31. ^ Williams, D.M. ; J.F. Kasting (1996). "Habitable planets with high obliquities". Lunar and Planetary Science 27: 1437–1438. Retrieved on 2007-03-31. ^ Whitehouse, David. "Earth's little brother found", BBC News, October 21, 2002. Retrieved on 2007-03-31. ^ Staff (September, 2003). Astrobiology Roadmap. NASA, Lockheed Martin. Retrieved on 2007-03-10. ^ Dole, Stephen H. (1970). Habitable Planets for Man, 2nd edition, American Elsevier Publishing Co.. ISBN 0-444-00092-5. Retrieved on 2007-03-11. ^ Ward, P. D.; Brownlee, D. (January 14, 2000). Rare Earth: Why Complex Life is Uncommon in the Universe, 1st edition, New York: Springer-Verlag. ISBN 0387987010. ^ Hillebrand, Helmut (2004). "On the Generality of the Latitudinal Gradient". American Naturalist 163 (2): 192–211. ^ Staff (November 24, 2006). Mineral Genesis: How do minerals form?. Non-vertebrate Paleontology Laboratory, Texas Memorial Museum. Retrieved on 2007-04-01. ^ Rona, Peter A. (2003). "Resources of the Sea Floor". Science 299 (5607): 673–674. Retrieved on 2007-02-04. ^ Staff (February 2, 2007). Evidence is now ‘unequivocal’ that humans are causing global warming – UN report. United Nations. Retrieved on 2007-03-07. ^ David, Leonard. "Planet's Population Hit 6.5 Billion Saturday", Live Science, 2006-02-24. Retrieved on 2006-04-02. ^ Staff. World Population Prospects: The 2006 Revision. United Nations. Retrieved on 2007-03-07. ^ Staff (2007). Human Population: Fundamentals of Growth: Growth. Population Reference Bureau. Retrieved on 2007-03-31. ^ Peel, M. C.; Finlayson, B. L.; McMahon, T. A. (2007). "Updated world map of the Köppen-Geiger climate classification". Hydrology and Earth System Sciences Discussions 4: 439–473. Retrieved on 2007-03-31. ^ Staff. Themes & Issues. Secretariat of the Convention on Biological Diversity. Retrieved on 2007-03-29. ^ Staff (2006-08-15). Canadian Forces Station (CFS) Alert. Information Management Group. Retrieved on 2007-03-31. ^ Staff. International Law. United Nations. Retrieved on 2007-03-27. ^ (July 2005) Random House Unabridged Dictionary. Random House. ISBN 0-375-42599-3. ^ Harper, Douglas (November 2001). Earth. Online Etymology Dictionary. Retrieved on 2007-08-07. ^ Liungman, Carl G. (2004). "Group 29: Multi-axes symmetric, both soft and straight-lined, closed signs with crossing lines", Symbols -- Encyclopedia of Western Signs and Ideograms. New York: Ionfox AB, pp. 281–282. ISBN 91-972705-0-4. ^ Werner, E. T. C. (1922). Myths & Legends of China. New York: George G. Harrap & Co. Ltd.. Retrieved on 2007-03-14. ^ Jacobs, James Q. (February 1, 1998). Archaeogeodesy, a Key to Prehistory. Retrieved on 2007-04-21. ^ Ackerman, Forrest J (1997). Forrest J Ackerman's World of Science Fiction. Los Angeles: RR Donnelley & Sons Company, 116–117. ISBN 1-57544-069-5. ^ Staff. Pale Blue Dot. SETI@home. Retrieved on 2006-04-02. ^ Fuller, R. Buckminster (1963). Operating Manual for Spaceship Earth, First edition, New York: E.P. Dutton & Co.. ISBN 0-525-47433-1. Retrieved on 2007-04-21. ^ Lovelock, James E. (1979). Gaia: A New Look at Life on Earth, First edition, Oxford: Oxford University Press. ISBN 0-19-286030-5. ^ Meyer, Stephen M. (August 18, 2002). MIT Project on Environmental Politics & Policy. Massachusetts Institute of Technology. Retrieved on 2006-08-10. ^ a b Sackmann, I.-J. ; Boothroyd, A. I.; Kraemer, K. E. (1993). "Our Sun. III. Present and Future". Astrophysical Journal 418: 457–468. Retrieved on 2007-03-31. ^ Kasting, J.F. (1988). "Runaway and Moist Greenhouse Atmospheres and the Evolution of Earth and Venus". Icarus 74: 472–494. Retrieved on 2007-03-31. ^ Guillemot, H.; Greffoz, V. (Mars 2002). "Ce que sera la fin du monde" (in French). Science et Vie N° 1014. ^ Carrington, Damian. "Date set for desert Earth", BBC News, February 21, 2000. Retrieved on 2007-03-31. Yoder, Charles F. (1995). in T. J. Ahrens: Global Earth Physics: A Handbook of Physical Constants. Washington: American Geophysical Union. ISBN 0875908519. Retrieved on 2007-03-17. Williams, David R. (September 1, 2004). Earth Fact Sheet. NASA. Retrieved on 2007-03-17. Comins, Neil F. (2001). Discovering the Essential Universe, Second Edition, W. H. Freeman. ISBN 0-7167-5804-0. Retrieved on 2007-03-17. Kirk Munsell:Solar System Exploration: Earth. NASA (October 19, 2006). Retrieved on 2007-03-17. Geody Earth World's search engine that supports Google Earth, NASA World Wind, Celestia, GPS, and other applications. Planet Earth From AOL Research & Learn: Photos, quizzes and info about Earth's climate, creatures and science. The Earth's atmosphere is 77% nitrogen, 21% oxygen, with traces of argon, carbon dioxide and water. In common with the entire solar system, the earth is moving through space at the rate of approximately 20.1 km/sec or 72,360 km/hr (approximately 12.5 mi/sec or 45,000 mph) toward the constellation of Hercules. The earth consists of five parts: the first, the atmosphere, is gaseous; the second, the hydrosphere, is liquid; the third, fourth, and fifth, the lithosphere, mantle, and core, are largely solid. Clearly the magnetism of the earth is the result of a dynamic rather than a passive condition, which would be the case if the iron core of the earth were solid and passively magnetized.